Zen Spirit Matcha is the best way to start your day full of energy, concentration, and tons of organic nutrients. Our Culinary Matcha is considered as a Ceremonial Grade in Japan because of the fresh color, richer taste and also silkier texture than others on the market. Our brand is dedicated to selecting the best Matcha leaf from the most exclusive organic farms in Japan. We strive to create a perfect powdered combination that will result in a premium product that all our customers can enjoy on a daily basis. ● Fresh Color & Richer Taste than traditional Culinary Matcha. ● High in Antioxidants Especially The Powerful EGCg. ● Excellent Source of Amino Acids Especially L-Theanine. ● Detoxifies Effectively, Lowering Cholesterol & Boosting Energy Naturally. ● Improve Health, Daily Focus & Relieves Stress. ● Lose Weight by Boosting Fat Metabolism and Suppresses Appetite. ● Helps to Prevent Disease, Reduce Skin Aging & Best Black Tea Substitute! ● 100% Customer Satisfaction Guarantee or Refund. Limited Quantity Available for Sale on Amazon with an opening price of 50% off! Order Your Zen Spirit Premium Organic Culinary Matcha Today While Prices Are Reduced! 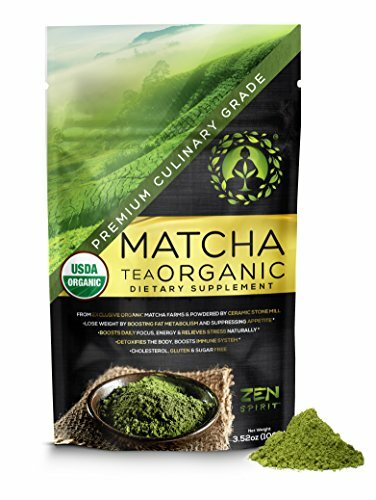 100 Grams / 3.52oz of 100% Premium Japanese Matcha Green Tea Powder USDA Organic, JONA and Vegan Certified. Harvested and Packaged in Japan From Exclusive Organic Matcha Farms and Powdered by Ceramic Stone Mills. Zen Spirit's Matcha Culinary Grade is a Perfect Superfood for Cooking and Preparing Your Favorite Recipes. Such as Baking Cakes, Cookies, Delicious Smoothies, Lattés, Iced Tea, Herbal Teas. Some Make use of the Powder as a Steak Tenderizer. With your Purchase We also Include an E-book with 10 Easy Recipes that May guide you to Begin enjoying the Matcha World. Our Premium Matcha Offers The Best Source of Antioxidants & Amino Acids such as (EGCg) & (L-Theanine). It is also 100% Cholesterol, Gluten & Sugar Free. While the Rest of the Market Focuses on Offering Lower Quality Matcha for Less, We Simply Offer The Best Culinary Matcha in the World for a Better Value for Your Money. Matcha Powder Detoxifies the Body, Boosts Immune System, Promotes Weight Loss By Boosting Fat Metabolism, Lowering Cholesterol & Blood Sugar. All the While, Boosting Daily Focus, Increased Energy & Relieves Stress Naturally. It also, Helps to Prevent Diseases And Reduces Skin Aging. Customer Satisfaction is our #1 Priority, Therefore, Our Matcha Powder has 100% Money Back Guarantee. If for any Reason You Are Dissatisfied With Your Purchase, Please Feel Free to Send Us a Message to Grant a Refund. We Appreciate You for Choosing Zen Spirit. If you have any questions about this product by Zen Spirit, contact us by completing and submitting the form below. If you are looking for a specif part number, please include it with your message.